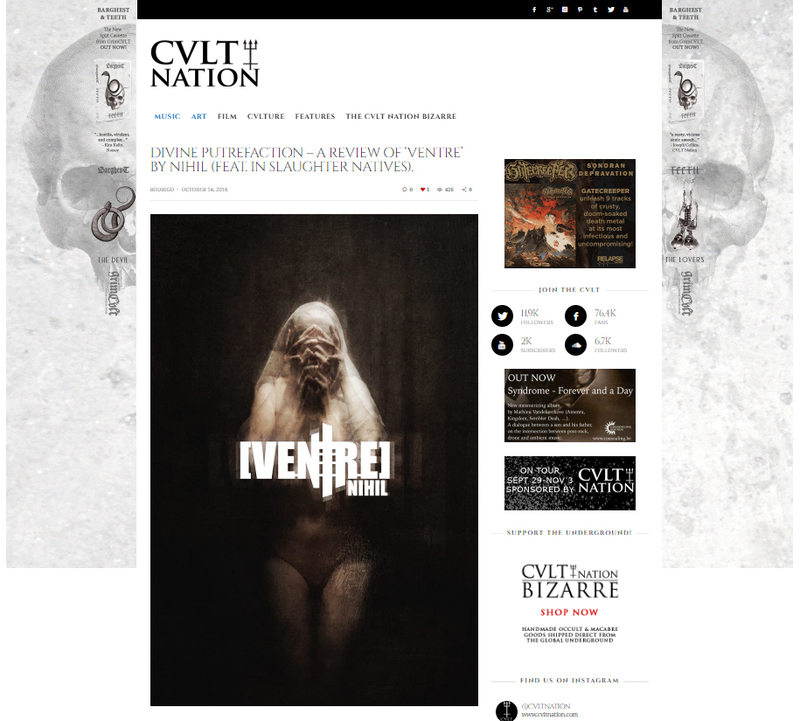 Ventre is a voyage through filth, cruelty and decay. It’s a hard trip into the darkest labyrinths of the soul, a mystic rite of passage into the Tunnels of Set and the forbidden Qlippoth*. The vistas are bleak, unforgiven, painful – but with a certain beauty, a grotesque beauty; and the sounds, they’re harsh, dark, cold and desolate, atavistic memoirs found in the deepest unconscious abyss, maybe from a doomed world long ago. This is the world that digital artist and graphic designer Nihil with the collaboration of In Slaughter Natives achieve with the artbook Ventre. The book is composed of small tales, more like oneiric narratives or mystic visions, but there is nothing light or ethereal here; Nihil’s mystical journeys are full of darkness, pain and despair, like a Clive Barker nightmare (some of the tales reminded me The Hellbound Heart or Tortured Souls), they’re full of surgical tortures, enslaved zombie-like creatures, despotic viral gods, cancerous quasi-organic buildings, destroyed worlds, etc. A tour de force through a dark initiation into the deepest corners of the soul, where atavistic and demonic forces inhabit. The second part of the book is composed by digitally altered photographs, all of them sinister, mutilated and surgically altered saints, many of them in ecstasy, it is said that martyrs entered in an ecstatic state after prolonged pain and suffering and these bleak characters do the part. The majority of them have no face, or their features are statue-like, robbing them of their humanity and individuality; the aesthetics remind me of Silent Hill meets Hellraiser meets Martyrs. Last, but not least, it’s the soundtrack specially created by cult post-industrial band In Slaughter Natives. It is 35 minutes long, but enough time to deliver darkness and bleakness, perfectly accompanying the text and images of the book. Although it is not the more martial sound of earlier releases, it creates the perfect atmosphere exploring more dark ambient sounds and even using some acoustic instruments along the electronic sequences and samples. As an overall experience, I would say it achieves what it promises: a decadent and scary trip to the dark side, both visually and aurally. Ventre is published by Cyclic Press, a division of record label Cyclic Law. *Note: For those of you who are not familiar with the concept of Qlippot and Tunnels of Set. According to kabbalistic lore, the Qlippot are literally shells, averse divine attributes, the dark counterparts of the Sephirot (attributes of God present in all creation according to jewish mysticism) in the Tree of Life, hollow and malignant, they represent death, chaos and destruction, a dark will to destroy creation or twist it. The Tunnels of Set are paths connecting all Qlippot to each other in the sinister Tree of Death.